Supercapsular Percutaneously-Assisted Total Hip surgery or SuperPATH ® surgery is a novel method of hip replacement where your surgeon can perform total hip replacement through 2-3 inch incision into the tip of the hip and without dislocating the hip or damaging the surrounding soft-tissue (muscles and tendons). This technique is also referred to as the Northern Approach or Northern Exposure. 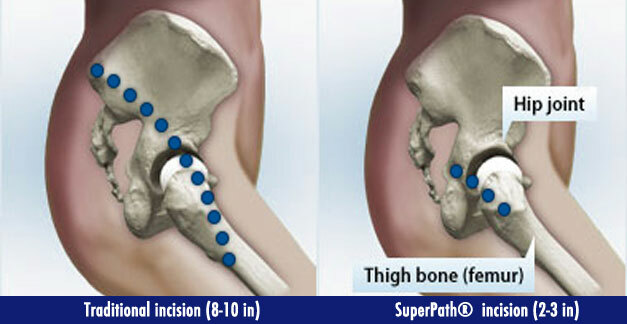 The SuperPath ® technique is restorative technique because it enables the surgeon to insert the tools and implants inside the body thereby can avoid unnatural positioning of hips. On contrary in traditional techniques your surgeon may need to twist the hip where your hip may be positioned in unnatural positions thereby having more postoperative complications. Additionally, the SuperPath ® approach is entirely adjustable and can be customized for every individual as per the patients’ needs. This technique allows the surgeon to consider implant selection, patient’s anatomy and if required individual muscles are released in a selective manner during surgery. The SuperPATH ® approach combines cutting-edge technology and advanced surgical techniques to encourage soft tissue preservation and enable patient to shorten their recovery to weeks, rather than months as in traditional approaches. Supercapsular Percutaneously-Assisted Total Hip surgery</strong> or SuperPATH<sup>®</sup> surgery is a novel method of hip replacement where your surgeon can perform total hip replacement through 2-3 inch incision into the tip of the hip and without dislocating the hip or damaging the surrounding soft-tissue (muscles and tendons). This technique is also referred to as the Northern Approach or Northern Exposure. The SuperPATH<sup>®</sup> technique is restorative technique because it enables the surgeon to insert the tools and implants inside the body thereby can avoid unnatural positioning of hips. On contrary in traditional techniques your surgeon may need to twist the hip where your hip may be positioned in unnatural positions thereby having more postoperative complications. Additionally, the SuperPATH<sup>®</sup> approach is entirely adjustable and can be customized for every individual as per the patients’ needs. This technique allows the surgeon to consider implant selection, patient’s anatomy and if required individual muscles are released in a selective manner during surgery.